First let’s be clear Queen Latifah has been on the K Word #WCE list FOREVER1. We loved Khadijah. We loved Cleo. Hell, even Big Mama Morton could have got it back in the day. Wait what were we talking about? Oh yeah. One of the League of Extraordinary Lesbians, Martina Navratilova has tied the knot to her longtime girlfriend Julia Lemigova on Monday, December 15th. Warm wishes to the happy couple from us over here at the K Word. If you missed the proposal video from of Navratilova proposing1 at the US Open last September, check it out below. Many Americans seem to only remember one of the two namesakes of the 2009 federal hate-crime bill signed into law by President Obama: Matthew Shepard. Similarly, many Americans also seem to only remember the bill as the Matthew Shepard Act. However, this abbreviated mention conveniently leaves out the other person for whom the act is named: James Byrd Jr.
Shepard was a white, gay college student who was brutally assaulted by two homophobes near Laramie, Wyoming, and died six days following the heartrending attack. His death now haunts our collective consciousness, reminding us that hate against LGBT people might surely mean death. James Byrd Jr., on the other hand, was a Black man from Texas. Byrd was ruthlessly murdered by three men, two of whom identified as white supremacists. His ankles were chained to the back of a pickup truck, and he was dragged approximately three miles along an asphalt road in Jasper, Texas. In the process, his head and right arm were severed from his body. His torso was eventually left in front of a cemetery that mostly contained the bodies of other Black people. Whereas Shepard was murdered because of his perceived sexual identity, Byrd was killed because he was Black. Read the rest on Huffington Post…. 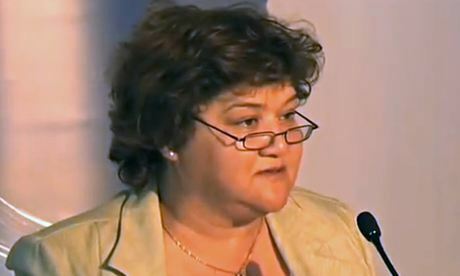 Lynne Browne is believed to be first openly-gay cabinet minister in Africa. She will serve as Minister of Public Enterprises. The significance of her appointment is innumerable, especially against the backdrop of an extremely homophobic continent.